Laboratory Precision in the Palm of Your Hand! The new Palm Abbe is a fourth-generation digital handheld refractometer that puts laboratory precision in the palm of your hand. Not just laboratory precision, but laboratory precision for the price of a traditional analog refractometer. It is exactly the kind of bold, cutting-edge technology you would expect from MISCO, the company that pioneered the digital handheld refractometer. 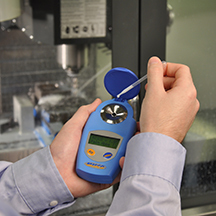 The Palm Abbe refractometer is fast, convenient, and easy to use. Simply place a drop or two of fluid in the titanium well and press a button. The custom-designed microprocessor delivers a nearly instantaneous readout in degrees Brix. Nonlinear temperature compensation is automatic and insures that fluids read between 0°C and 50°C (32°F to 122°F) are measured accurately. The large LCD display is easily read, even in dim light, and removes the subjectivity associated with interpreting where a boundary line crosses tiny scale divisions. And, it is so easy to use! The user interface consists of two buttons, one to take readings and the other to step through various menu options.